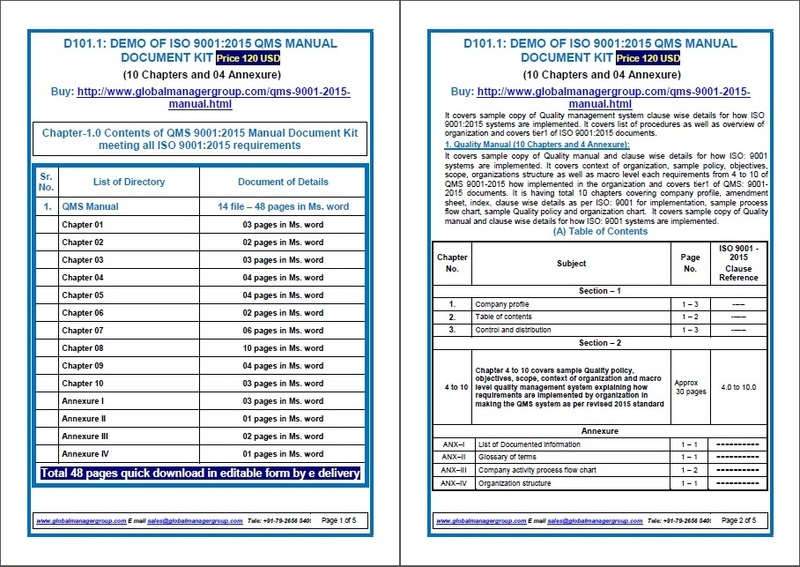 QMS 9001:2015 manual is a special manual drafted and endorsed to ensure effective quality management for organizations. It applies to both small and large corporations. It consists of the best hypothesis that can be followed by any company to ensure that the staff is motivated and the customer's needs are satisfied. It conforms to the latest version of Quality Management System requirements. QMS 9001:2015 focuses on the services your management offers to clients, consumer education, relationship between your firm and clients, motivation and training of your personnel, company facilities and equipment. In the QMS 9001:2015 quality manual the macro level system for how each requirement of the standard is implemented in the organization is written and references of procedures as well as quality policy are included. No doubt the first step towards achieving a QMS certification is proper implementation of the Quality System Manual.